Text & Photographs By Glen (BAHDog) © All rights reserved. For years, I have used the northern Arizona town of Page as a base to refuel and overnight on long mapping missions. In summer, this is a town where throngs of tourists converge. Many come to be out on Lake Powell, a lake with more shoreline than California. Some called the coming of this lake a sort of apocalypse. Others are on a pilgrimage to the much-photographed Antelope canyon. You can raft the Colorado River if you please. There are many things to do and many people doing all of them. This is the time of year I avoid the place. If summer is a boomtown, winter is a ghost town. That is the time I like the best. I have the place to myself. Years ago, I discovered an old road that had been cut off when a new one was built. Desert plants grow up through the cracks and portions are being consumed by the desert. 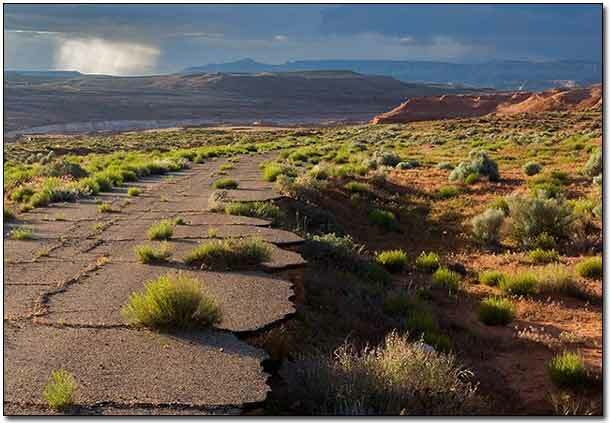 Time seems different once I am on the road, which I have always called Apocalypse road. Not one other person has passed on the old thoroughfare as I have put my boots to it. It is an enchanted conveyance into an enchanted wasteland. 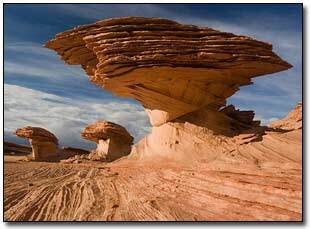 The area was formed in the Jurassic period when grains of translucent sand were borne on those ancient winds, one by one. This was part of a vast desert, which rivaled the Sahara in scope. Dinosaurs walked here and in time went through their own apocalypse. 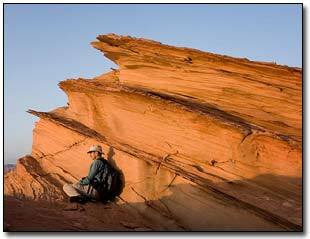 Time petrified the sand dunes into sandstone, which weathered into the shapes we see in our age. I have never been one to follow trails for very far before going off a field nor do I force photography. I am always drawn off the road into the landscape and somehow the camera comes to be in my hand. Time disappears. The moving hands on the watch and the sun rotating over the strange shapes are the only evidence of the moving time. Everything is quiet, yet everything is happening. You come upon things both small and large that unfold out of a landscape that has a way of hiding them. This is the place where nobody else goes. There is no pathway beaten through the scenery to guide them here. This could be most anywhere in the vast sandstone countryside and there are many hidden secrets that the land will slowly give up to those who travel into it. One can become disoriented in this type terrain. You need to bring several things when you go into this place. A well equipped daypack is advised with plenty of water, insulation for warmth when the north winds are blowing through, a GPS, paper map and compass for backup as well as the other essentials for those who travel remote. You will find solitude and sights that very few have ever seen. All it takes is an adventurous spirit. A panorama that looks to be devoid of beauty can suddenly open up into a shocking display of such. Every time I have gone out into this magic place, I have walked back in the dark, a tiny speck in a vast landscape. You do this at your own risk. Know your skills and limitations. This land is unforgiving for those who blunder into it. Part of me is always on edge out here. You find when you return, somehow, many images are in your camera. You do not remember taking some of them. You have been gone for a few minutes but the sun has traveled many hours and has slipped over the horizon. The vertigo you experience will take yet more time to level back out. As you strive for perspective in your photographs, you find perspective in this world.